Here's a slice of absolute pure americana. 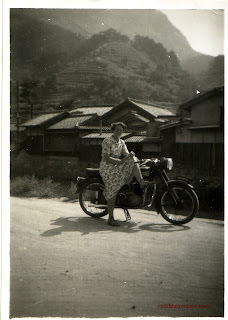 It's all so instantly recognisable it could not have been taken in any other country. 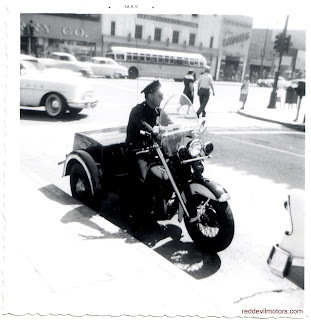 To top it all the photo has the note 'Hollywood Boulevard' on the reverse. Harley Servi-Car on Hollywood Boulevard. Belgian brand Minerva hasn't featured on this blog before so here to rectify this is the below photo. 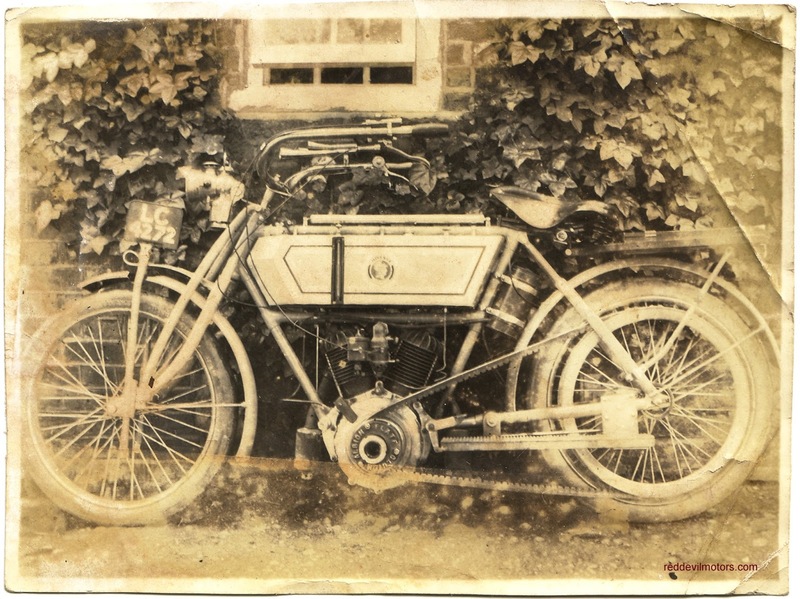 I would put the date of the bike as circa 1905 - the Minerva v twin was introduced in 1905 and this one has a trembler coil rather than magneto. The bike seems to have been modified as the pedal gear has been removed and footboards fitted. 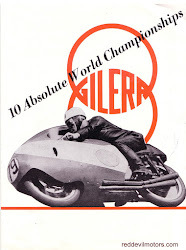 For an excellent history of Minerva motorcycles check the Minerva Motocyclettes 1900 - 1909 site. c 1905 Minerva v twin. It was slightly inevitable wasn't it, my Bantam that has not been used for thirteen years and that was thrashed around by seventeen year old me has turned out to need a rebuild. After reviving the little Beesa three months back it has proved to be a difficult starter and a most prodigious leaker of oil. Old two strokes have many qualities which some folks find endearing and others less so, but oil leaks are not normally one of them. This particular example dumps its full load of gearbox oil out within a couple of days. I can stand a small, or even medium sized oil leak, I don't mind a few spots left in the pub car park but this is next level and unacceptable. Easy, a quick rebuild was in order. New gaskets to cure the leaks and new seals whilst it was apart: should be do-able in an evening or two. Of course life doesn't always work out as planned and the scope of the job expanded considerably. The motor came out of the frame wonderfully easily. I haven't worked on a small two stroke for a good while and it was a joy not to have to strain with lifting up a brutish lump of British cast iron four stroke. It did not however come apart quite so willingly. The points cam should slide off as it is just held on by a small nut and a keyway. Such was the confidence of BSA engineers that it would just slide free once the nut was undone that they made no provision for a puller to fit it at all. So I gave it a couple of light clouts with a hammer to shock it in to action. The clouts gradually increased in magnitude. Next step I gave up on salvaging the cam and resigned myself to buying a new one so out came the mole grips. Still nowt in the way of movement. OK, hammer combined with mole grips, next step, oh crap, the end of the crank has snapped off. In mitigation of my seemingly mechanically inept actions there is no easy way of getting a stuck points cam off a Bantam and after it had snapped off it did indeed prove itself to be rust welded to the crank. lesson from this to share with all is to never assemble keyed components dry, use oil and preferably, if the application allows (as a Bantam points cam does), copper grease /anti-seize. The rest of the motor was happily a breeze to dismantle. Rather remarkably as the engine has not been apart for well over forty years and was ridden by teenage me the bearings were all in fairly decent condition. The seals however were completely shot to the point where they were in two pieces with one part turning with the crank and the other sitting in the cases and a healthy gap between the two. It is a minor miracle that it ran at all. The options for the crank were a second hand crank that would more than likely then need rebuilding or to go for a cdi ignition system that wouldn't need the points cam so I could use the original crank. I decided on a new ignition as the sparks were rather weedy and it seemed that in the end it wouldn't cost much more than a refurbed crank. There are two different cdi options available for Wipac flywheel magneto equipped Bantams, the Rex Caunt designed one now sold by Rusty Rooster Motorcycles and the Electrex World one. I've heard good reports of both but I went for the Electrex World item as it is a plug and play job whereas the Rusty Rooster kit requires you to send in your old stator plate for light modification. I was in a hurry to get the job finished and off my workbench plus the Electrex World item is stocked by my local old bike suppliers Feked. Spanky new Electrex World ignition fitted. A Bantam motor is a nice and easy motor to put back together and I gained some respect for the design engineers behind it as it all falls to place nicely, each part has its obvious place and it really is fairly hard to get it wrong. The cdi ignition was equally doddle like to fit in place and time up. I hid the coil and regulator /rectifier away between the battery carrier and tool box. I was a bit sad to see the characteristic Wipac rectifier go as, to give credit where due, the lighting was always pretty good on the bike even if the sparks were slightly feeble. Wipac stator and this bolts straight on. With the motor back in and wired up the bike fired up fairly readily. A few kicks to get it primed and going, after that it was pretty much a first kick job. So far so good then for the Electrex World ignition. I'm not convinced it will make a whole load of difference out on the road, I'm confident I'll still need to rev the nuts off the bike in second at thirty at the sign of an incline and not have the added flexibility to chug up in third. However if I have only gained easy starting and been saved having to throw away the original crank I shall be happy. I'll post again after a few miles have been covered to give the Electrex World system a proper review. Absolutely no idea where this photo was taken, all I can say is nothing about it looks very British, the bike is German, the foliage looks vaguely tropical or at least in warmer climes and the building perhaps Asian though just maybe from the Dolomites or even South America. And the family? No idea. 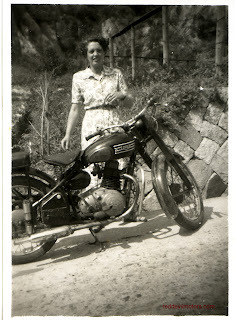 What is easy though is to identify the bike as a very distinctive NSU, either a Max or a Super Max. It looks rather well used, though is evidently cherished enough to include in a family photo. 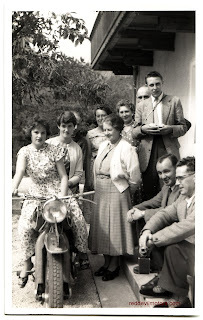 this photo of a family and their NSU. 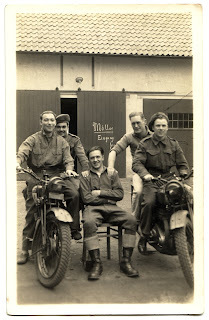 At a guess from the smiling faces and German writing in the background the war is at an end and these lads can relax a bit. 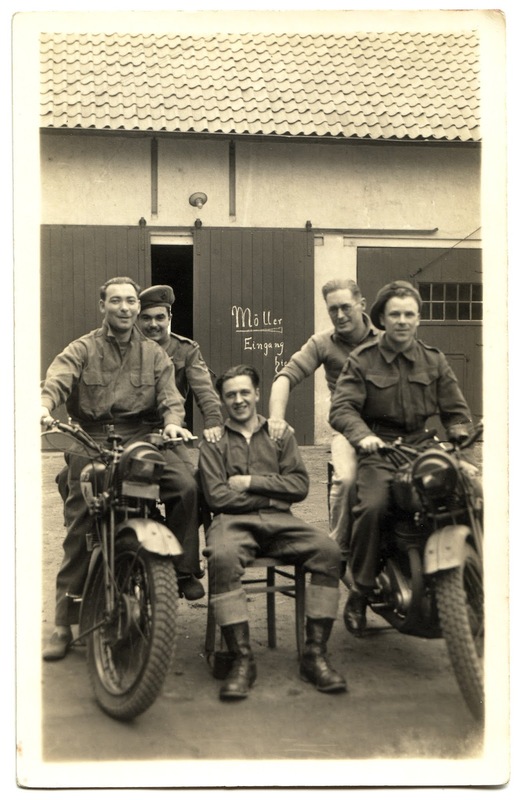 The bikes are BSA M20s. Many thanks to James Kelly for the loan of this cracking photo to scan and post. Big thanks to Colin Gibson for getting in touch about a couple of photos of an early fifties Liner that I posted a short while back. Colin has identified the bike as a 'Portly' model from 1954. Liner was the brand name of the Kitagawa Motor Company who were taken over by Yamaha in 1959. 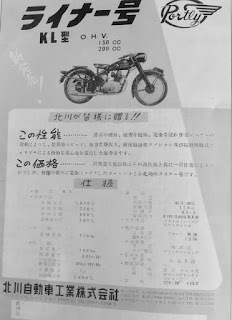 A quick search on Kitagawa reveals that they also made a clone of the Sunbeam S8; worth a look if that sort of thing interests you. Colin has kindly fowarded a copy of the Liner Portly brochure for publishing. 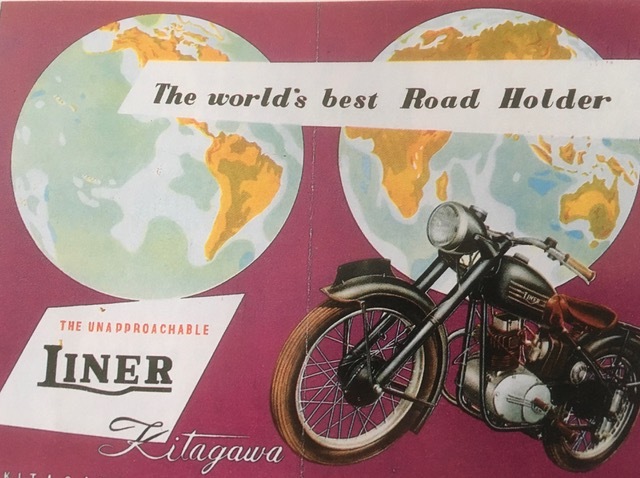 If the Portly takes its design cues from the Triumph Terrier the frontispiece of the flyer is an unashamed rip off of Norton advertising material! Whilst Norton may well have laid a decent claim to being the 'World's Best Road Holder' Advertising Standards would have had something to say about the Liner Portly had they been around in Japan at the time. It seems that Portly was a reasonably apt name as the machine had only six horses to push around its 120kg. None-the-less a fascinating machine and piece of history and it would be great to see one in the flesh. Incredible how this was the level of machinery Japan was producing in 1954 but just four years later the Honda Cub appeared. And one of the photos previously published. I try to stop myself accumulating projects but evidently I am weak willed as here is the latest heap of work in two wheeled form that has come my way. The frame is branded as a Condor and is believed to date from 1982. From those not in the know Condor is a large London based bicycle shop and brand. Back in the day they would sell frames made by well known London frame builders alongside their own in house frames and off the peg jobs. Vic Edwards Condor twin tube hellenic time trialer. Vic Edwards was one of the builders who would regularly supply frames to Condor and it was he who built my latest project. Vic also sold frames under his own brand name of Rondinella. I'm a sucker for steel road bike frames of unusual design and this particular one scores highly for unconventional features. Whilst both the split seat tube (twin tube) and hellenic (rear stays joining the top tube rather than seat tube to create a triple triangle) features were both used by several manufacturers from the thirties through to the current day I am not aware of any other frames that combine both. It is believed that this frame is one of two made by Vic, the other was sold as a Rondinella. 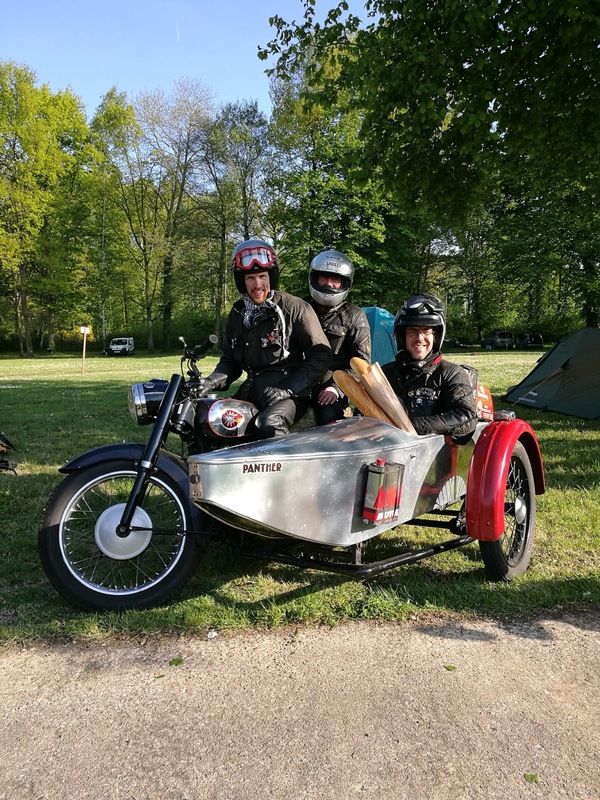 As if the twin tube hellenic design is not enough the frame is made from Columbus Air tubing which was the first generation of teardrop shaped aerodynamic tubing. The intended use of this frame was for time trialing, as such it does not have provision for a front gear mech, indeed it would be quite difficult to fit one with the twin tube design. I've thrown a few parts lying around at the frame to make it in to something rolling so that I can visualise it better. The accumulation of appropriate parts is slowly underway. I had thought to fit a Shimano 600AX groupset as this was a first generation aero groupset but unfortunately with the brakes being centrepull they will not work with the hellenic design. One stumbling block that I had not anticipated when I bought the frame is that the seat post is also of aero profile to match the tubing, it was originally supplied with the tube set and is now as rare as the proverbial. Not to worry though I am not in a rush and these things have a habit of turning up eventually. Here's what this frame is all about! On a recent check over of my Velocette I noticed a little bit of slop in the swinging arm. Time for new bushes. For anyone not in the know Velocettes have an unusual swinging arm arrangement whereby there are two separate forks which clamp on to a trunnion (shaft) passing through the frame of the bike. The bushes are phosphor bronze and are pressed in to the frame. Why did Velocette do it like this? I'm not too sure. The manufacturing must be a good deal cheaper and it is lighter. You might think that there would be issues of rigidity but Velocettes are good handlers so this isn't an issue. For the mechanic the main drawback is the need to make sure that the forks are aligned with each other on re-assembly. 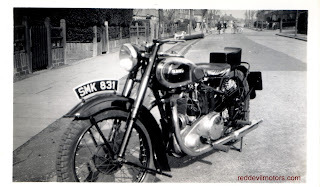 Like a lot of quirky Velocette engineering the bottom line is that it all works quite well so rejoice in the eccentricity of your machine and get fearlessly spannering. 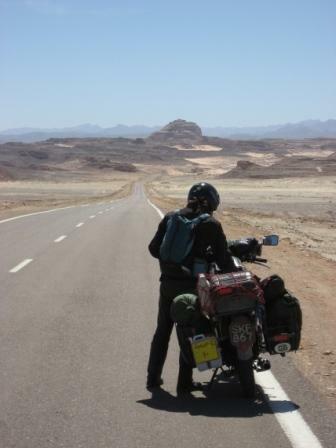 First point to be aware of is that it really is not worth trying the job without taking off the chainguards and chain as a minimum. I thought that access was good and it would be a sinch without, I was wrong - I struggled and then gave in and took the lot off. You could have a crack at it with the wheel left in place as I did but to make life as easy as possible you might as well invest the time in removing the rear wheel and sprocket and the suspension units. Using a socket to drift out the trunnion. Next point, it you think that the trunnion will just easily slide out you may be in for an unwelcome surprise. Mine had to be beaten out with extreme prejudice. The easiest way without proper factory tools is to use the good old socket of appropriate size as a drift trick. Once the trunnion is poking out the other end either use a long drift to smash it all the way through or grab and twist with a pipe wrench or mole grips. A bit brutal maybe but essentially the part is scrap anyway. Once the trunnion is out the forks will drop away allowing you to now have a crack at the bushes in the frame. In the absence of a slide hammer puller a long drift has to suffice. Once one side is out the old trunnion can be used as the drift for the other. trunnion. The wear is fairly easy to see. stand lug is now also fixed. With the new bushes in place fit the new trunnion through the swinging arm forks and frame. It will be a snug fit but shouldn't require too much persuasion. Oil it for fitting and grease once in place. Now time for alignment. Folks seem to labour over this rather a lot but essentially once you've got the wheel back on and the shockers in place alignment will pretty much come naturally. To get the job perfect two straight edges will do the trick - one across the swinging arm and one against the wheel vertically. If they are 90 degrees to each other then the job is a good 'un. There we go. Job done. If you take one piece of advice away from this it is to remove any parts that look like they will possibly need to come off to do the job comfortably before you begin. I tried without so that you don't have to. Slightly blurry photo but what a cracking combination. 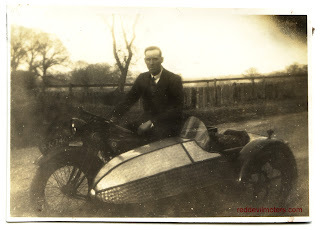 It is a mid to late twenties Rudge four valve four speed with a lovely 'zeppelin' styled chair as was the fashion for sporting outfits of the period.